Oscar Best foreign language film 2001. Champaner… a small farming village in central India. The year is 1893 on the outskirts of the village stands a British cantonment commanded Captain Russell (Paul Blackthrone) an arrogant and capricious man who wields the power of life and death over the villages under his jurisdiction. When the villagers are unable to pay the crippling land tax imposed on them by their British rulers due to draught and famine. Captain Russell offers them a challenge. To assemble a team and face the British Soldiers in a game of cricket a game they have never heard of. If the villagers win the land tax will be waived for three years. If they lose it will be tripled. 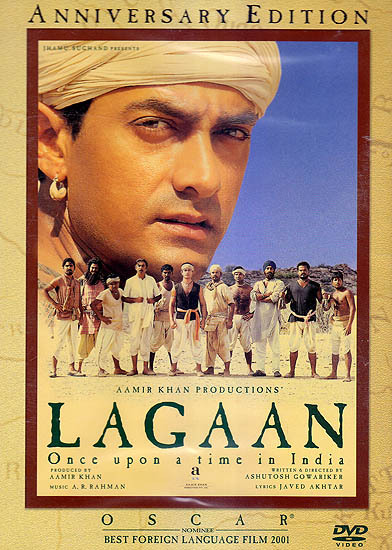 One man Bhuvan (Aamir Khan) an enigmatic young farmer with courage born of conviction thinks the challenge is worth staking their entire future on. But has he got what it takes to convince the other villagers and in turn beat the English rulers at their own game.